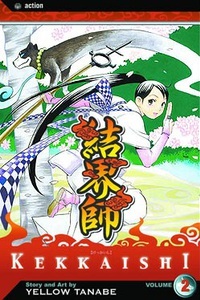 By day, 14-year-old Yoshimori Sumimura is just a regular kid going to junior high school, but by night he is a "kekkaishi," or demon-fighter who specializes in generating magical barriers around his prey before making them disappear. His neighbor is 16-year-old Tokine Yukimura, who is also a kekkaishi! Together they share the knowledge of their ancient art and their nights battling beings from the netherworld. Sounds fun, but their families don't get along, because each believes their family to be the "true practitioners" of the art of the kekkaishi. Although Yoshimori and Tokine often quarrel, they battle demons side-by-side almost every night. When the two barrier-masters must confront Oni Yoki, a dangerous demon-charmer, their partnership weakens. Can they fight together to keep their world from the clutches of a power-hungry monster? Story and art by Yellow Tanabe.